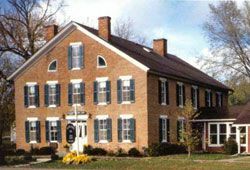 When Joy Hanson and her husband, Chuck, purchased the Mason House Inn after Chuck's retirement from the Air Force, they knew the historic inn had at least one ghost. It was not surprising; the inn's 160-year history had seen three of its owners die in the hotel, and one guest murdered. What was surprising was how many ghostly guests remained in the hotel, and how active they were. About Hotels: How many ghosts do you believe are in the hotel? Joy Hanson: We have at least five spirits that we know of. The Mason House Inn was built in 1846 and three of the owners have died here. It was used as a hospital during the Civil War, and again by a doctor who was living here in 1920-40. He died here of diphtheria along with several of his patients. There was a murder in one of the rooms. AH: Have guests of the hotel reported seeing these ghosts? JH: We have had guests tell us of their experiences from seeing a foggy image, to seeing a boy on the landing who likes to play tricks on people, to an old lady in a white nightgown, to an old man who "just looks at me and then disappears." We have a bed that gets mussed up when no one has been in the room. A guest in Room 5 said his pajama shirt sleeve was tugged on while he was sleeping. Thinking it was his wife wanting him to turn over, he tried to turn over and his sleeve did not come with him. He looked and he could see his sleeve being tugged over and over but did not see anyone there to tug on it. He remembered that his wife did not come with him on this trip. The sleeve continued to be tugged for several more seconds and then it quit. He hopped out of bed and would not lay down again. He was very shaken by the experience. He is a Minister and did not believe in ghosts. Now he does. A guest was checking in and she looked up the stairs to the second floor and told me "Did you know you have ghosts here?" I asked her if she could see them, she said, "No, but I can feel them. They are happy here and don't want to leave. One did not die here, but liked it here in life and came back. They like it here and won't hurt anybody. They just don't want to leave." Another guest came to me one morning after breakfast and asked if I knew the place was haunted. I asked her to tell me why she thought so. She said, "I was sitting in the rocking chair reading a book last night. My husband was in the shower. Suddenly the room got freezing cold and a column of fog started to form about 4 feet away in front of me. It got thicker and thicker and I knew I was about to see a ghost. I broke out in goosebumps all over my body and I gasped. Then it suddenly disappeared. It was not scary, just weird. I wanted you to know the place is haunted." Another guest checking in looked up the stairs and said "Oh no. You have a ghost here. I am too tired to deal with this tonight. Can I have a room in that building over there?" (Indicating our annex building which used to be an old store and is now 2 bedrooms.) I gave him one of the annex bedrooms and he was gone by the time I got up to make breakfast. Two guests, who claimed to be able to see the spirits, told me there is a boy about 12 or 13 years old who hangs out on the second-floor landing. He is dressed in knickers. He is waiting for something or someone. He likes to play tricks on the guests. He is aware of us and waves at people and then looks confused and sad when they do not wave back. We have named him George. George likes to knock on doors, and when people open the door, there is no one there. He likes to take things and put them in other rooms. He likes to pull the pins on the old alarm clocks and make them ring. (We put digital clocks in some of the rooms and he does not know how to work those.) Maybe he was the one tugging the man's sleeve in Room 5. These same guests said there is an old lady on the third floor, south bedroom, who likes to look through our boxes we have stored in that room. My daughter has her bedroom in the north bedroom on the third floor and she says she has seen an old lady in a long white nightgown standing in the doorway to that room. She was visible for a second and then she vanished. People staying in Room 5, which is directly below that room, have said they heard thumping up there like something was dropped on the floor. Another complained of being kept awake all night by a squeaking rocking chair up there. There is no rocking chair in that room. It is just a storage room. AH: There was one murder in the hotel? JH: We have a newspaper account of a murder that took place in the Inn. A Mr. Knapp was stabbed in the heart and died in one of the rooms. He was trying to get into a bed that was already occupied. (He had been visiting the tavern and was confused as to which room was his.) The man in the bed thought he was being robbed, took a saber out of his walking stick, and stabbed Mr. Knapp in the heart. Several guests have told us that something violent happened in Room 7 and they get a bad feeling in that room. This room is directly above the kitchen and I often hear footsteps up there when no one else is in the house. I will go up to see if a visitor has come in off the street and is taking a "look around." There will be no one up there, but the bed looks like someone had been laying on it. I think Mr. Knapp is still trying to get into bed. My daughter was in that room making the bed one day and as she bent over to tuck in the sheet, she got patted on her fanny. Thinking it was me trying to play a joke on her, she turned around but no one was there. She left the room fast and would not go back up there without me. AH: What about the owners that have died in the hotel? JH: Fannie Mason Kurtz died in the dining room, by the fireplace, in 1951. She was the last Mason to own the building. We had a guest eating lunch in the dining room who kept looking at the fireplace and then around the room, and back at the fireplace. Finally, she said to me "Someone died in this room, here by the fireplace. She is still here. She is walking around the room and greeting the guests. She is happy. She likes it here and does not want to leave." The lady could not see the spirit, but could feel her as she passed by. My daughter and I have both seen "shooting orbs" in the dining room. They look like a shooting star zooming across the TV or the lamp and catching the light for a fraction of a second. Mr. McDermet, [a retired Congregationalist Minister who bought the inn in 1989], told us he had seen the ghost of Mary Mason Clark on the third floor. He had his office in that south bedroom and he would often look up from his desk to see her sitting in a chair by the window. She told him she was not happy with the renovations they were doing on the house. The McDermets turned ten bedrooms into five two-room suites with private baths in all the rooms. This meant taking out some walls and putting in others. Lewis Mason, [who purchased the hotel in 1857], died here in 1867 during a cholera epidemic. Mr. Knapp died here in 1860. Lewis's daughter, Mary Mason Clark, died here in 1911, up on the third floor in the south bedroom. She was 83 years old. Lewis Mason's granddaughter, Mary Frances "Fannie" Mason Kurtz, died here in 1951 at 84 years old. She died in the dining room, in a rocking chair by the fireplace. She was dead three days before anyone checked on her and found her. JH: We figure we have two ladies (Mary Mason Clark on the third floor and Fannie Mason Kurtz on the first floor), one old man, a boy, and Mr. Knapp in Room 7. There may be more. We know a doctor died in Room 5 in 1940 of diphtheria. He was renting that room when it was a boarding house from the 1920s to 1951. We also know the building was used as a holding hospital during the Civil War. Wounded soldiers were brought here to wait for the train to take them to the hospital in Keokuk. We can only assume some of them died here also. We also know the house and barn were used as a station on the Underground Railroad. I don't know if this is significant to the spirits or not, but it is interesting. AH: Have you seen the ghosts yourself? JH: Personally, I have seen a tall, gaunt old man with white hair. Occasionally, when I look into one of the old mirrors on the second-floor hallway or the parlor, I see him standing behind me. I turn to look and there is no one there. I look in the mirror again and he is gone. This has happened to me about five times since we moved here in June of 2001. He has just a head, his body is a column of fog. I call him "Mr. Foggybody." Maybe this is what was forming in Room 5 in the previous account. AH: Do you know who he is? JH: I think it may be Francis O. Clark who managed the Inn for his father-in-law, Lewis Mason, for several years. He did not die here, but his wife, Mary Mason Clark, brought his body here for the wake and he is buried in the Bentonsport Cemetery. This may be the man who "did not die here, but liked it here in life and came back after death." I have seen pictures of Mr. Clark and he was thin and had white hair. My daughter has seen a "floating head" in Room 8. The room was dark and she did not see any foggy body. She said it was an old man with white hair. AH: What else have you experienced? JH: We have heard footsteps when no one else was in the building. Just a few weeks ago, I was dusting upstairs when I heard footsteps in the hallway. These were clomping boot steps. Thinking it was my husband looking for me, I called out "I'm in Room 7!" But he did not come in the room. I finished my cleaning and went downstairs where I found him talking on the phone in the office. I asked him what he wanted and he said he had been on the phone the whole time I had been upstairs. It was not him in the hallway. The front door was locked and no one from the street could have gotten in. My daughter-in-law and her father came for a visit in March and they were staying in Room 5. She said she had gone to bed early and was waiting for her father to come to the room so she could turn off the lights. She heard him climb the stairs, but he did not come into the room. Later she heard him climb the stairs again and this time he did come into the room. She asked him why he had come up earlier but did not come in [but] he had been downstairs talking to me the whole time. I saw him climb the stairs only once and go into the room. There were no other guests on that floor that night. We have found windows closed when I knew they had been opened and open when I thought they we all closed. The front door has often been found locked when I know I had left it open for late night arriving guests. We have heard footsteps when we are the only one home, and twice we heard a rattling plastic bag that woke us up at night. In the morning I found an empty Wal-mart bag laying by the door. (I wonder if George likes plastic bags.) Our bedroom door often opens and closes at night. Sometimes gently, sometimes slamming shut. If I say "Stop it, go away," it will stop. Guests have mentioned hearing doors closing and footsteps in the hallway all night long. Either everyone was asleep or they were the only ones on the floor; either way there was no one else who heard the noises, just the one person. AH: How did you come to own the hotel? JH: My husband, Chuck, retired from the Air Force after 25 years of service. We were living near Dayton, Ohio at the time. We decided we would like to try our own business and decided to buy a small farm in Iowa. While looking at a realtor's web site for farms, we saw this old hotel for sale also. On a trip through Iowa in the summer of 2000, we stopped to look at some of the farms for sale, and also the old hotel. We fell in love with the hotel and decided to become Innkeepers instead of farmers. A year later, after [Chuck] retired, we bought the place and moved in. It came fully furnished will all the original beds and dressers and furniture. We are the fifth owners, and each time the place has been sold intact with all the furniture and furnishings, so it is full of original Mason family antiques. Mr. Mason was a furniture maker, and he made a lot of the pieces here. AH: Did you know the hotel was haunted when you purchased it? JH: We bought the Inn in 2001 knowing there was an old lady on the third floor. That is why we use that room as a storage room and not a bedroom. (We had lived in a house in Virginia that was haunted by a little boy who was killed in the back yard, so this was nothing scary for us.) But right away we noticed there is more going on than we were told about. Maybe about a month after we moved in, we started hearing footsteps and noticing the locked door and open or shut windows. We've seen shooting orbs in the dining room and Room 7. One daughter got patted on her fanny and another daughter had her towel tugged on when she got out of the shower. It has been just one thing after another for almost three years now. Guests continuously tell us their experiences from previous visits or current visits. When something happens, we try to explain it. Was the wind blowing? A loose shutter maybe? Was someone really there when we thought we were alone? (Quite often I have been surprised by a visitor taking a "self-guided tour" through the Inn.) And also quite often we cannot explain the noises and happenings. When guests and visitors ask if the hotel is haunted, I don't know what to say. Some people are frightened away if I say it is. Others are thrilled and can hardly wait to have some kind of an encounter. Usually though, it is the ones not expecting anything that tell me of their experience of something "weird." And the people expecting something to happen, are disappointed that they did not get levitated or their blankets yanked off like on the Travel Channel shows. Sorry, ours are not that dramatic. Footsteps, knocking, doors locking and windows opening and closing, a messy bed, an occasional glimpse of a former owner are the norm. Our ghosts don't want to hurt anybody, they just like it here, they are happy and don't want to leave.